We all love the zoo as kids. Now as adult artists, we can love them for the opportunity to draw them live. I was always disappointed at the lazy lions, because I came to see them move. Now that would be an advantage to get a long pose, while I draw. Draw your pets. Draw your dogs, cats, birds, fish, snakes and hamsters at play and rest. 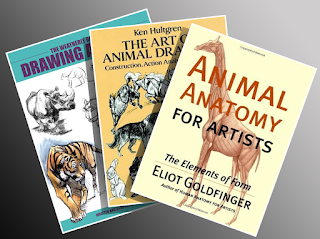 Now add books to study the anatomy and we fill in an overlooked area that is a weak spot for most artists. Animals don't have the same muscular structure as human. Here are some recommended books to buy or read. I say read, because, if once again, you have an excuse that you can't afford to buy them, then you can use the library for free. Buying any of these books I recommend below, gives me a little kick back and helps support me doing the blog.